Two aquatic parks equipped with heated swimming pools, an indoor pool and water slides each more insane than the others. Activities and entertainment which give children as much fun as their parents! 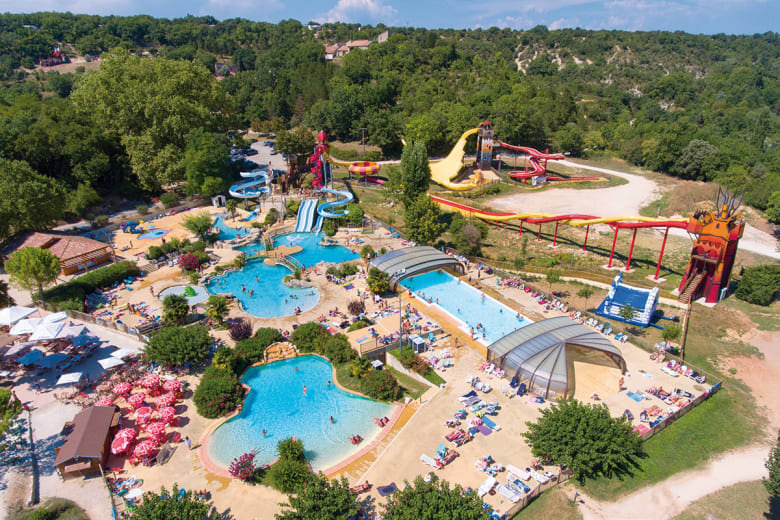 To the south-west of Montélimar, the 4-star campsite, Imbours, is one of the most fantastic open-air hotels of the Ardèche department! A genuine shrine to holidays, it offers its holidaymakers top-quality accommodation and leisure, all nestled within the heart of a verdant 230-hectare site! 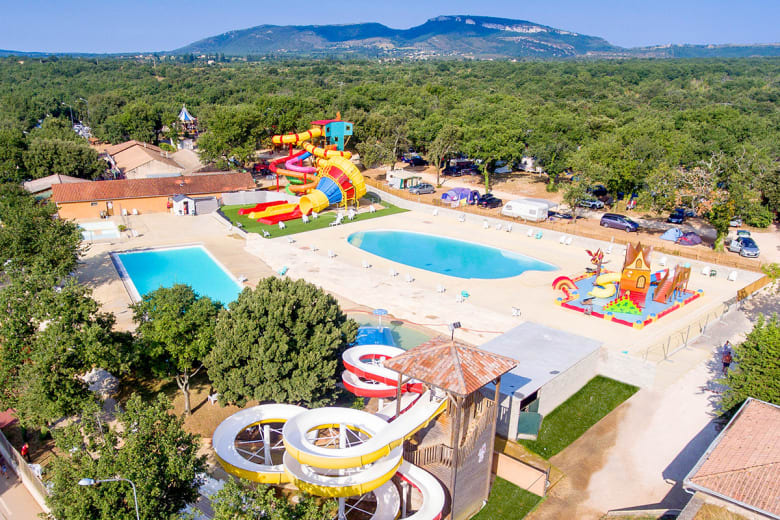 Located less than thirty kilometres from Montélimar, the capital of Nougat and the so-called “Gateway to Provence”, the Imbours campsite is located at the heart of a 230-hectare wooded park. This is crossed by a lovely stream after which, moreover, the campsite has been named. A stone's throw from Larnas village and the Sainte Beaume mountain ridge gorges, this campsite enjoys a situation which could not be more perfect. Midway between Lyon and Marseille, between the Rhône valley and the Gorges de l’Ardèche (Ardèche gorges), holidaymakers staying at the 4-star campsite, which is a member of the Cap Fun group, indeed have the possibility of discovering the Vivarais (the Ardèche department), the Drôme department, the Vaucluse department and the Cévennes mountain range! 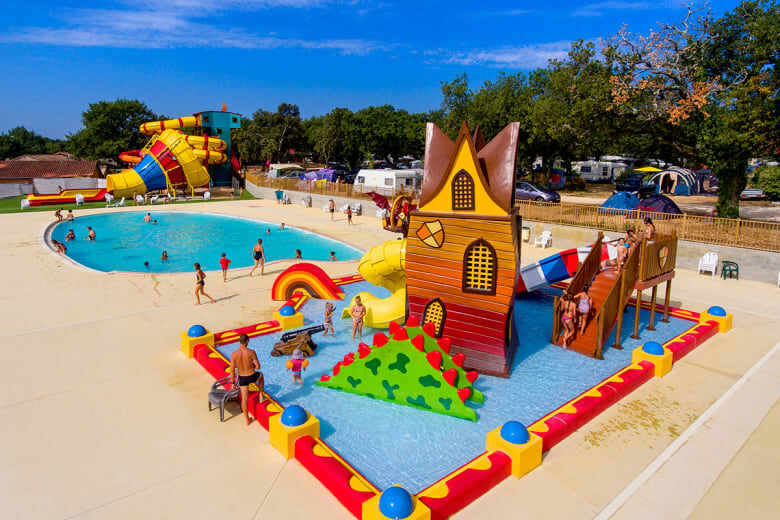 With plots ranging from mobile homes to chalets, caravans, fully equipped tents or even studios, the Imbours campsite offers holidaymakers numerous accommodation solutions. Amongst the most luxurious, the mobile homes and chalets in to the Top Presta range, thus enjoy air-conditioning and an HD television, as well as a dishwasher. For enthusiasts of glamping holidays, Imbours has thought of everything, as it is possible to hire for a night, a weekend or week the out of the ordinary Palmita accommodation. This is accommodation which harmoniously mixes materials such as canvas and wood. Equally you can hire fully equipped caravans with a 20 m² surface area for such durations. There are two aquatic parks to take your breath away! With its countryside setting, this campsite accommodates a multitude of services able to satisfy all holidaymakers. Thus during the season, from the opening through to the closure of the Imbours campsite, a restaurant as well as a snack bar are both open. These accommodate holidaymakers wishing to treat themselves to a good meal or indeed those simply looking for one or more of the takeaway meals. The the 4-star Ardèche campsite grocery is also open throughout the season, whilst a bar welcomes holidaymakers in high season and at the weekends during May. To ensure that its holidaymakers are always satisfied, Imbours has a wide choice of leisure facilities, the most spectacular of which are, no doubt, its two aquatic parks! And yes, there are in fact within this campsite not one, but two, areas dedicated to swimming and aquatic leisure activities! Moreover, during the high season, a shuttle bus links these complexes so that holidaymakers can go quickly between them. The first park comprises, in addition to two heated lagoon pools, an heated indoor swimming pool, as well as numerous incredible water slides. Amongst the latter, the most impressive are the SpaceBowl, in which thrill-seekers have the sense of being thrown at high speed whilst spinning, the Racer, perfect for racing, the Twister or even the Tsunami, where daredevils, sat on a rubber ring, are thrown every which way! Other water slides, which are simpler but just as much fun, bring joy to the very young and their parents. This is, for example with case with the multi-run slides or the Adder which has been specifically designed for children under 6 years. It offers them an area in which both to use slides and swim safely. For those even younger, aged 3 to 6 years, a games island has been set out so that they can have fun discovering the joys of water! Holidaymakers at this Ardèche campsite have stars in their eyes. The second aquatic park is made up of a large heated pool, a paddling pool including a play structure. There is also a tower from the top of which several other slides start. Moreover, lovers of idleness and sunbathing are also able to have a whale of a time since around the swimming pools of both aquatic spaces, numerous sunbeds have been placed. 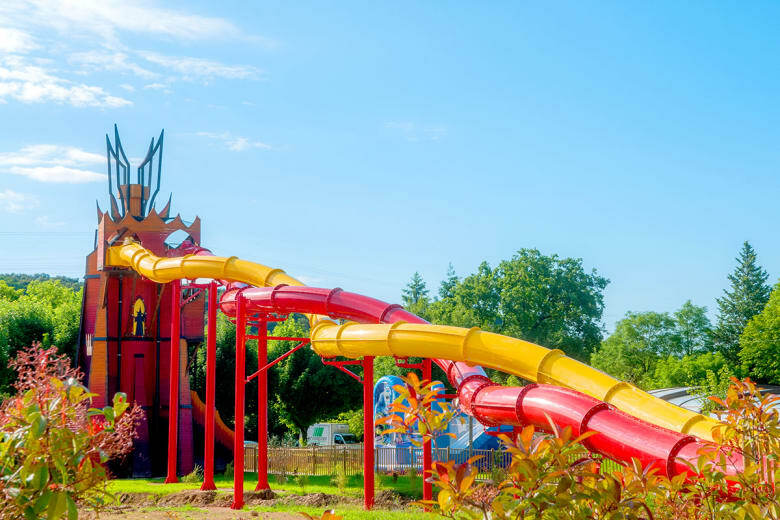 If these facilities leave you dreaming of holidaying here, you should know that the Imbours site has several play areas for children for whom an inflatable structure as well as a “Castle for the battle of 15 dwarves”, where the fairy Carabouille dwells! Amongst the other facilities of this luxury Larnas campsite, it is worth mentioning the multi-sports ground, the area for playing pétanque, the ping-pong tables, the games rooms as well as a sauna. It is also worth noting that during the Easter and Ascension holidays, a children's club, as well as a baby club are open on-site. During the high season, the Baby club welcomes children aged 6 months to 3 years, the Clapou club those aged 4 to 6 years old, the Policator club those aged 7 to 10 years, the Dragonicums club those 11 to 14 years old and lastly the Nobodys club, those aged 15 to 18 years! Finally, various other activities are furthermore organised on-site during the day, such as the invigorating wake-up pool workout every morning. Entertainment is scheduled five evenings a week, during the high season. There is plenty to do in spending unforgettable holidays either as a family or with friends!